Hvert år tappes lokalsamfunn og stater over hele verden for milliarder av kroner på grunn av såkalt illegitim finansflyt. Forsiktige anslag indikerer at 10 milliarder kroner blir ført illegitimt ut av land i Sør hvert år. Skjulte finansstrømmer forsterker fattigdom samtidig som det legger til rette for at noen få holder seg ved makten gjennom korrupsjon og maktmisbruk. 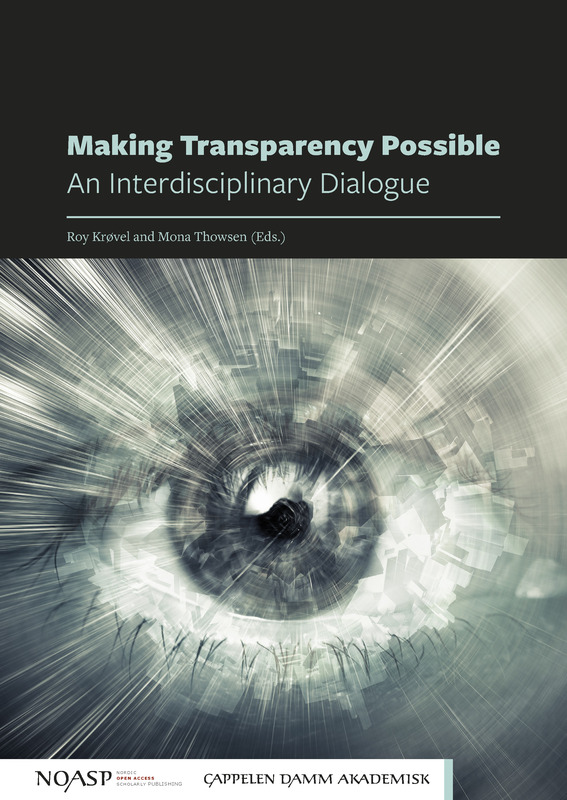 Forfatterne av Making Transparency Possible ønsker å bidra til mer åpenhet om finans og globale finanstransaksjoner. I første del av boka forteller gravende journalister om arbeidet for å avsløre korrupsjon og finansflukt. Varslere i noen av de mest kjente sakene forteller sin historie, mens advokater og revisorer forklarer hva som må gjøres med lovverket. Den andre delen av boka består av analyser av korrupsjonsavsløringer og illegitim finansflyt. Forfatterne belyser tema som verdien av gravejournalistikk, nye journalistiske metoder, mangelfull beskyttelse av varslere og utdanning av gravejournalister. Boka passer for alle som er interesserte i illegitim finansflyt, men passer spesielt for journalister, journaliststudenter og journalistikklærere som ønsker å forstå hva som trengs for å avdekke mekanismene i skjulte, globale finansstrømmer. Roy Krøvel er professor ved Institutt for journalistikk og mediefag ved OsloMet – storbyuniversitetet og koordinator for prosjektet Making Transparency Possible finansiert av Norges forskingsråd. Krøvel leder forskargruppa Media, krig og konflikt. Han er PhD i historie og sivil ingeniør frå NTNU. Krøvel er professor II ved Sámi allaskuvla / Samisk høgskole. Mona Thowsen is the secretary general of Publish What You Pay Norway (PWYP Norway). PWYP Norway consists of 20 Norwegian organizations and is the Norwegian affiliate of the international network Publish What You Pay. PWYP member organizations span over 50 countries. Frian Aarsnes is an international tax expert with experience from more than 30 countries. Aarsnes worked at an international audit firm for six years, at a major global oil and gas provider for 10 years on international tax issues, and in international consulting for 13 years on, among other things, fiscal design and fiscal mechanism analysis. Mahima Achuthan is an oil/gas/mining transactional, regulatory and policy advisory professional whose key focus has been on corporate responsibility, environmental and social risk management (ESRM), business and human rights, stakeholder management, grievance mechanisms, anti-corruption and beneficial ownership disclosure. She has practiced with a boutique law firm in New York and is a part-time lecturer at the School of Public and International Affairs, Columbia University, where she advises graduate student consultancies on ESRM for clients in the private sector. Achuthan has a B.A. from the University of California, Berkeley, a J.D. from the University of Minnesota, Law School, an MA. from Columbia University and is a member of the New York Bar. Behlül Çaliskan completed his PhD in journalism at the University of Marmara in Turkey. In his academic work, he has mostly focused on theoretical and empirical studies on media, communication and culture in Turkey. He is currently working at the University of Macedonia in Greece as visiting researcher. Elisabeth Eide er forfatter, journalist og medieforsker, ansatt på Høgskolen i Oslo og Akershus. Hun har gitt ut en rekke fagbøker, fem romaner og har bidratt til en rekke antologier og tidsskrifter. Johannes Kr. Kristjansson is an Emmy-nominated, Pulitzer Prize-winning investigative journalist whose work on the Panama Papers resulted in the 2016 resignation of the prime minister of Iceland. Kristjansson founded his own media company, Reykjavik Media, in 2015. He also co-founded and is a board member of the Icelandic Center for Investigative Journalism and has lectured on investigative journalism at events throughout the world. From 2005 to 2009 Kristjansson was the editor-in-chief of “Kompas”, a weekly investigative news program on Channel 2. He also worked as an investigative reporter for “Kastljos”, a daily news program at RUV, the state television station in Iceland. Kristjansson has been honored for investigations into black market gun trade, sexual abuse of minors, government corruption, and more. He was made an ICIJ member in 2016. Amélie Lefebvre is a lawyer at the Paris Bar and a partner at Bourdon & Associés. She previously worked at the International Criminal Tribunal for the former Yugoslavia (ICTY) for two years. She holds a Master’s Degree in International Law (University Paris I Panthéon Sorbonne, 2008) and a Master in Laws Degree from Trinity College, Dublin (2009). Lefebvre practices primarily in the areas of international criminal law, extradition law, general criminal law, economic criminal law and family law. She has participated at conferences on financial transparency, accountability and recovering illicitly gained assets through international cooperation, and she regularly gives classes in international criminal law to executive auditors at the Ecole Nationale d’Administration. Simona Levi is a theatre director, playwright, activist and technopolitical strategist born in Italy and naturalized Spanish. She is a prominent activist in European social movements supporting the free circulation of knowledge, culture and information, e-democracy, strategic use of digital tools for organization, communication, collective action and the struggle against corruption. Founder of the digital rights organization Xnet and co-creator of the anti-corruption device 15MpaRato that jailed 15 politicians and bankers in Spain, in 2017 Rolling Stone magazine chose Levi as one of the 25 people in the world who are shaping the future. Craig McKune has worked as an investigative journalist in South Africa for ten years. Most of that time was spent with the non-profit amaBhungane Centre for Investigative Journalism, where he reported on corporate fraud, government corruption, money laundering and offshore finance. He was a key reporter on South Africa’s agenda-setting “Gupta Leaks” project. He is now working on global research and communications projects on offshore financial flows and climate change. Kalle Moene er professor i samfunnsøkonomi ved Universitetet i Oslo. Ryan Powell is a media development specialist implementing projects in east and west Africa and Europe. He consults and advises advises independent start up media on content and sustainable business strategies, currently on a project in Tanzania with the Media Development Investment Fund. He spent two years as a media development associate for the Natural Resource Governance Institute training journalists on resource governance, data-use and security. As a journalist, Powell has been based in Turkey, Germany and the US. He holds an MPhil in Development Studies from Oxford University. Among his recent publications is Data Journalism in Tanzania (World Bank). Jenik Radon is an adjunct professor at the School of Public and International Affairs, Columbia University. He teaches in the area of sustainable natural resource development and focuses on risk and strategic management, including environment, minority rights, and anticorruption. Radon has served as a Fulbright Specialist at the Law School of Makerere University, Uganda, and has taught at Stanford University’s law and business schools; Indira Gandhi Institute for Development Research in Mumbai, India; Monterrey Tech, Queretaro, Mexico; and Externado University in Bogota, Colombia. He also practices law with Radon Law Offices, a boutique international law firm. Mr. Radon has been awarded Estonia’s Order of the Cross Terra Mariana and Georgia’s highest civilian award, the Order of Honor. Radon presently advises public authorities and civil society in a number of emerging nations around the world and is the author of Walk Tall! A Beautiful Tomorrow for Emerging Nations (Paradise Publishing Haus Ltd., Papua New Guinea, 2018, published in connection with the 2018 APEC conference). Nandini Ravichandran is an attorney qualified to practice in India and the State of New York and experienced in international transactional law. She has represented private sector multinational enterprises and advised governments and state-owned enterprises in the natural resources sector, on issues related to environmental and social impact assessments, human rights due diligence, and corporate accountability. In her current role as a program manager for a legal aid organization in the United States, Ravichandran is responsible for the strategy, development and implementation of a federally funded program focused on increasing access to justice for immigrant populations. Anya Schiffrin is the director of the technology and media specialization at Columbia University’s School of International and Public Affairs and lectures on global media, innovation and human rights. She writes on journalism and development, investigative reporting in the global south and has published extensively over the last decade on the media in Africa and the extractive sector. Schiffrin served for nine years as a member of the advisory board of the Open Society Foundation’s Program on Independent Journalism, and she is currently on the OSF Global Board. Schiffrin’s most recent book is African Muckraking: 75 Years of Investigative Journalism from Africa (Jacana, 2014). Tina Søreide er samfunnsøkonom og førsteamanuensis ved Norges Handelshøyskole. Tidligere har hun vært ansatt ved Juridisk fakultet ved Universitetet i Bergen, Chr. Michelsens Institutt (CMI) og Verdensbanken i Washington DC. Hun har studert korrupsjonsrelaterte utfordringer i en rekke industrier, statlige etater og land – og har utgitt mange internasjonale fagpublikasjoner om temaet. Petter Slaatrem Titland has a BA in Human Geography and Latin American Studies from the University of Oslo and the National University of Colombia. From 2014 to 2018 he served as the spokesperson and chair of the Norwegian branch of Attac, an international social justice network working on issues like tax havens, trade agreements and financial stability. Rodrigo Véliz Estrada is a Guatemalan journalist and PhD student in history at CIESAS-México. He has specialized in Central America’s political crisis from 1944 to 1974.